Today I am thrilled to have Avery Elle and their designers as my guests! As a very special treat, not only is Avery Elle participating as my guests today but they are also promoting my event as their monthly challenge theme! Avery Elle is also a sponsor for this event and is offering one lucky winner one stamp set of their choice! 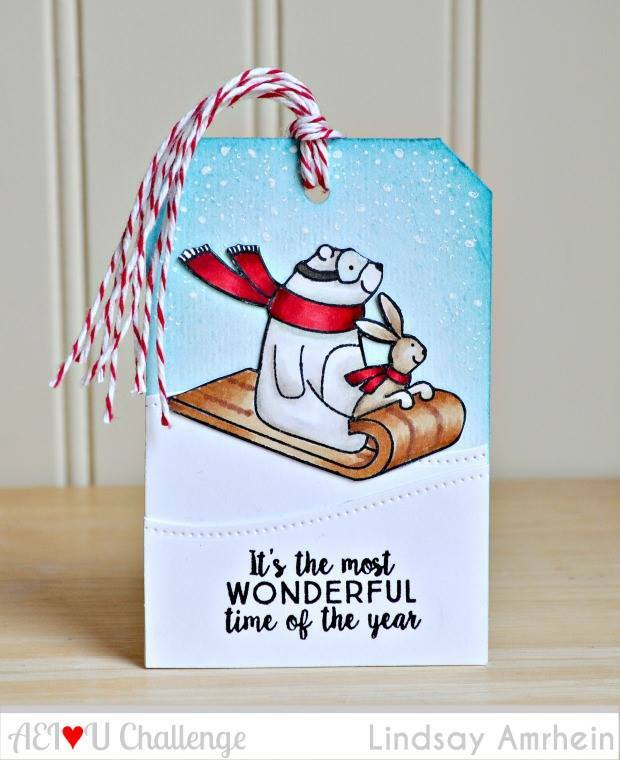 Comment for your chance to win here today by letting me know whether you usually purchase tags for Christmas or make your own? Oops..forgot to answer you question! No bought tags for me; handmade all. AND this year, as last, my Advent calendar for my niece and nephew will be a series of different tags inspired by...guess who! YOU! Thank you for the inspiration and the creative opportunities! Neither, because we don't exchange presents at Christmas. But if we were, I'm pretty sure I'd be making my own. Oh Wow ... the first post already!! Unbelievable ...time flies!! Awesome tags today!! Love that moose and those cute bears!! Well, in answer to your question--I make all my own tags. Actually, make more than I use or need, but isn't that what this hobby is all about. Super excited about your tags and sponsor today, as I just got a new AE Christmas set and am excited to play with it some more. I used to buy them until I fell in love with making my own. Now I make a set for myself every year and I recently started making a set for my parents as well! I usually make my own, either from scratch or I recycle Christmas cards I received last year. I also make tags for a friend to put on her Christmas baking that she sells. Great tags! Thanks for the inspiration. I usually make my own tags. I have in the past made my own, but had sort of a mental block last year so used ones that I had bought previously. I have a new set of PTI's tags that I hope to make mine this year. I guess I better get busy. Yeah! It has begun :) :) I only make a few hand made tags (for those I know will appreciate them) as it just kills me to see them going into the trash/recycle after the gift is opened LOL! If I make them at home, we recycle so we use them year after year. Thinking of making a few special ones which would mean you get a surprise gift, or you have to do something for someone, or share something etc. Could be a fun Christmas tradition. I make my own. I just got a couple of fun new dies that I am excited about trying out for this challenge! I make my own too Tracey...thank you for the inspiration and now I have something to do today!! I love making my own and I make extras for my daughter to use too. Congratulations on Year 5!! I love your double stamped wreath Tracey and all the samples from the AE DT are wonderful! Great tags, I usually do a bit of both. 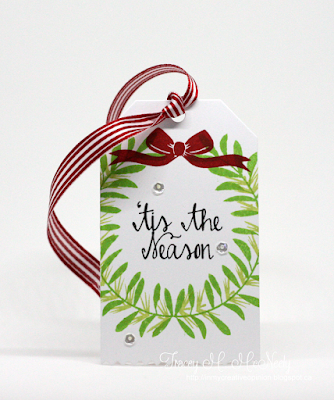 Last year I bought a pack of ready made kraft tags and simple stamped a Xmas Tree on each tag...easy!! These are all fabulous! I'm so excited for this blog series of yours -- it's so wonderful! I love to make tags for very special people or gifts each year. I love to make them but as it gets closer to Christmas I buy tags. They end up in the trash very quickly. I love your tags, Tracey! I love all the tags! I buy some tags, I make some.... but you are inspiring us all to make more! I usually purchase but this year I bought some tag dies from Hobby Lobby and thought I might do my own. I usually make my own tags. These are fabulous! What a beautiful start to your tag challenge. Love all of them! Great tags all, and such a variety of inspiration! I can't remember the last time I bought tags. ;) Why would I, when it's such fun to make my own? Some I go all out on, and others can be quite simple. Great, I always look forward to the 25 Days of Christmas Tags and they inspire me to make my own. Day 1 tags are so sweet and make you want to get started straight away ! Sad to say that I purchase my tags. I seem to have enough trouble getting homemade Christmas cards completed...lol!! Oh I'm so happy to see your 25 days of tags start up! There is always so much inspiration! All the tags today are gorgeous! I love yours with the wreath stamped off the edges! As for myself, I have always bought tags, because my family wouldn't even pay attention the the tags as they were ripping the presents open, but I am going to make a few this year to go on presents for some friends and more careful family! haha! Look at all of those fabulously festive tags!!! Thanks for the creative inspiration! I really enjoy making my own tags and gift packaging each year! It's so much fun! Thanks for the inspiration! Great tags! I make any of the tags that I need. What beautiful Christmas tags! I love making my own Christmas tags ever since I was little my Gram and I used to make tags out of old Christmas cards and tie yarn or any leftover scraps of ribbon to them. I am looking forward to this so much and seeing everyone's gorgeous tags! Tracey, what fun inspiration. I like to make tags. All these tags are FABULOUS!!! I have to say that I make my own tags. It is the only thing that I really create from scratch for everyone (besides baking!!) I do a photo card to make it easier on myself so the least I can do is make all my tags. It is so much fun too!! I ALWAYS make my own tags! Your blog has beautiful inspiring tags today. Sometimes I have my children help me make some. To be honest I don't have time to make many of my own so I have to use store bought. I usually make some and buy some. This year, Christmas will be very minimal, so not sure I will be needing too many tags! Keepin' it simple! I make my own tags!!! Love the beautiful AE tags!!! Well, I usually buy them, but its on my to-do list to stop doing that!! Gorgeous tags, I love your wreath on the tag combined with the beautiful ribbon. SUPER CUTE and BEAUTIFUL tags!!! I confess that I only need a few tags at Christmas, so I make most of them. Times have changed and so many now request gift cards, so gift card holders are in high demand ... maybe I can add a little pocket to some tags for them this year!!! Congrats on another year Tracey, looking forward to it! The Avery Elle team tags are adorable!! I make my tags, I and will be CASEing this beauty of yours this year! I love making my own tags for Christmas. Love the rich red on your tag, Tracey! YIKES - I commented too soon. LOVE your pretty wreath & bow Tracey - BEAUTIFUL design with the wreath going over the edges, I need to try it too!!! I am new to all of this and am so excited. I usually buy tags, but hope to make a bunch, with your great encouragement, this year. Thanks for the inspiration everyone. I usually make some and buy some too. Depends on how much time I have. how many can we join? Wow great tags for inspiration and I love your tag. I hope to join in the fun and happy you are hosting it. When I use tags I Always make them myself. Beautiful tags in this post! I have made a few tags for the last couple of Christmas', but plan to make them all this year! I make my own tags every Christmas. Thanks for the cute ideas! This is a bunch of cute tags. I do both. When I run out of time to get them made, I use store bought. check out all that fantastic inspiration! Hi, you tag is cute! I do both, I make some and buy some. These are sooo sweet!! Love! Congratulations on another year of 25 tags ...I know it will be another huge success ! Lots and lots of hard work but you can do anything ...Tracey!!! Beautiful tags today! I make my own tags, I enjoy creating them in many different shapes! These are so so awesome! I always make my own tags, too much fun and adds a personal touch! Congrats on year 5, looking forward to all the inspiration! I do make some tags and purchase some as well. It all depends on how much time I have after I make my Christmas cards. Incredible variety & all so wonderful! I want the wreath you used, Tracey, every time I see it! If I could walk in a store & get it I would! Gorgeous tag, Tracey! Your bow is so striking with your beautiful wreath, and the sentiment is perfect! Love today's adorable tags! I'm so excited to see your 25 Days of Tags start up. I can no longer not make all my tags. I bought some one year and got all kinds of comments from the family!! I'm now also making new backs for the old ones as my stepdaughter wanted to use them again. Love all the inspiration I get from this great event! I usually make my own tags but nothing as elaborate as those shown today. I give my grandchildren gift cards so they don't need tags but maybe I'll put tags on their cards this year. I ALWAYS make my own tags! Some years are fancier than others, but I can always throw something together in a pinch! So happy it's that time of year again! Wonderful inspiration today and I can't wait to see what the next 24 days bring! Beautiful tags.. I make my own tags for Christmas.. Right now I'm making cards. Hoping to start the tags this week, thanks to all the inspiration!! This is such a lovely tag Tracey and I haven't bought a tag in YEARS! GREAT TAGS! Thanks for hosting this! I make my own tags but they're nothing as elaborate or beautiful as these! I make most of them. I haven't purchased tags in years, but I have a few of those sticker sheet tags that I sometimes break down and use at the end when I run out of time. These are all so fabulous!!!! So much wonderful inspiration. Yay for the 25 tags of Christmas! So happy to see all the beautiful Avery Elle inspiration! And I love your beautiful wreath tag! I make tags for my entire family each year and hand them out at Thanksgiving....it is a much loved tradition. I always make tags for Holidays. Such a neat idea! 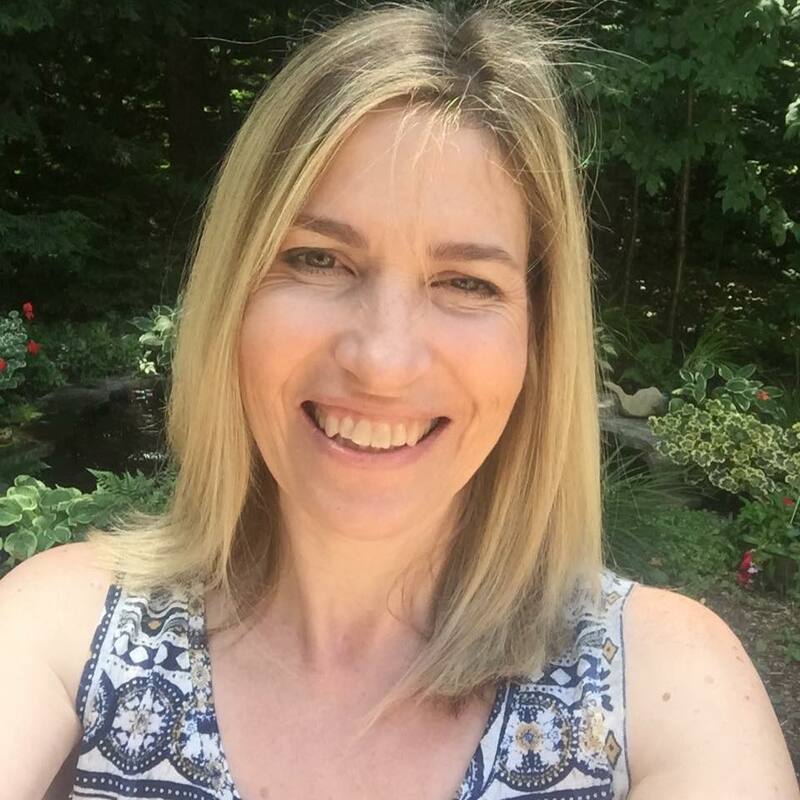 I'm following your blog now and look forward to seeing your tags each day. Cheers! I'm a "johnny come lately" to your blog - but glad I found it now! Thank you! I love the tags created by the Avery Elle team, and by you! In the past I haven't made too many tags so resorted to buying them :(. This year I aim to change that!! i usually make my tags but never very fancy. Looking forward to these ideas because I want to make some fun and beautiful tags this year. beautiful tags - I give so few gifts that I usually make my tags. 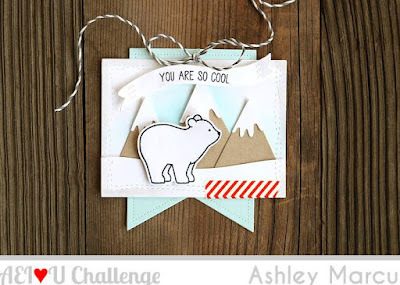 Dear Tracey - I remember this awesome event from last year - this is how I learned to make tags! Before your event, I had not made them before! I am looking forward to more tag inspiration this year - today's tags are gorgeous! I will hop around to get the details of everyone's tags. As for my tags, I do both. I make tags for special gifts and I also use some store-bought tags. I do make my own tags each year and lots of times I use the scraps remaining from making my Christmas cards. So much fun and this 25 tags of Christmas is a great idea! For a few year I used the ones I had let over from past purchase. Then last year and this year I made my own. Great tags from the DT. tfs! These are so great...the reindeer on the ice skates got a real chuckle!! Forgot to answer the question :P Thisis my first year making tags...so there will be no store-bought tags for this girl! I do both, but this year with all this great inspiration, I am making them all. Love all the tags. Purchase cards or tags never again! 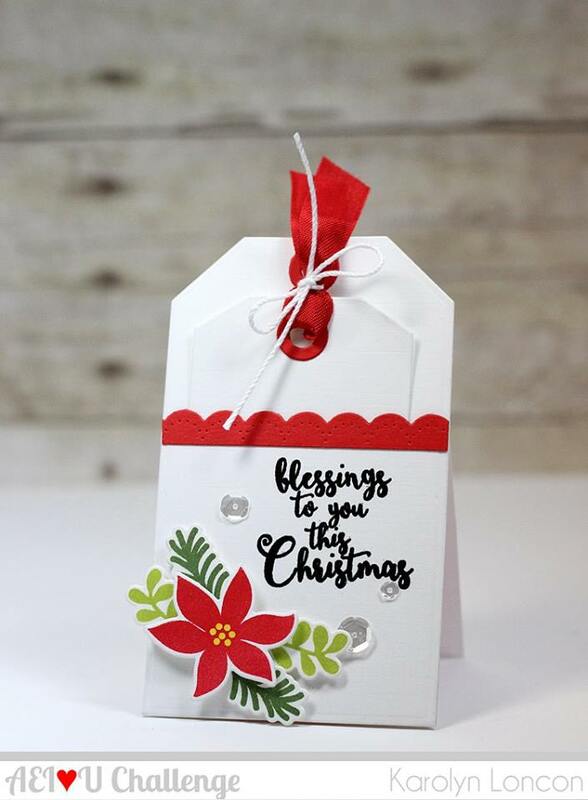 I have some purchased tags that we stick onto a lot of our gifts, but I do make tags also and they usually go onto special gifts, like our family exchange and our Godchild and special friends. TFS! Your tags are awesome and I've been following this since it began. This year I'm playing along with you everyday day. That's the plan, anyway! I make my own tags. Great way to use up scraps. Thanks for sharing! Until 4-5 years ago, I used to purchase my tags, but when I started crafting, I made my own tags. I definitely make them and I am getting inspired by this post. As a paper crafter I must make my own tags. I would like to say that I make my tags but I don't. I usually just make a few select special ones. I make my own...usually out of the wrapping paper itself, last minute---lame-oh!! The moose with skates is funny. I love the whimsy of these tags! I don't actually use tags at all, terrible I know!! I always use stickers to name the parcels. I did make tags one year but they were all just thrown aside and I was so disappointed after all my hard work. So stickers it is for me!! These are all so fun! The moose with skates and the polar bear with goggles are both sooooooo adorable!! I think I mainly tend to purchase tags, but do occasionally make them. I enjoy having them right there to start creating on! Adorable tags. I make my own and buy some. What a creative lineup! Love that wreath on your beauty! I usually make my own ;)... Gotta get going on those. I rarely make my own cards, but tags? Yep. I definitely make my own tags for Christmas. These are so cute, I love all the winter critters! Almost all of my tags are homemade. Sometimes I get desperate at the end, and use a stash of glittery stars I bought at Target years ago. So excited to see these cute tags. Every year I say I'm going to make my own, so hopefully these will inspire me this year (I just found your tag event). For the last couple of years, I have made some of my tags and bought some. This year, I hope to have the time to make all of them. 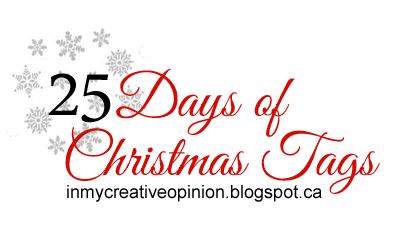 I certainly will have enough ideas and inspiration from these 25 days! I try to make all the tags for Holiday gifts. If I get pressed for time, I will buy the tags precut and create from there. LOVE these tags, so colorful and amazing how much card art you can fit on a tag! I usually make gift tags but especially like making tags for wine bottles! Your tag is too cute! I never purchase tags,I usually make my own. Love all these amazing inspirations! Your tag is very sweet and happy! I usually make my tags every year. This summer I woke up early two Sunday mornings and spent time spraying the backgrounds of many tags. Inky fun! I make my own tags. I haven't done them yet, i decided to make my christmas cards 1st this year. Homemade tags for me but I have had to buy a few now and then if I get behind on things. I usually make my own if I have the time. I love all the tags, I usually make all my tags. For family I make them personalized to each person. For the Santa for Seniors I mass produce a lot of them. Love the inspirations! Now that I think about it, my gifts are almost always tag-less, and when they do come with a tag, it's definitely handmade. Super cute tags!! I make my own tags, perfect time to use up scraplings!